Sunset Overdrive is a humorous third-person perspective shooter created by Insomniac Games studio. The player takes on the role of a cleaner who fights hordes of mutants that captured the eponymous post-apocalyptic city of Sunset. 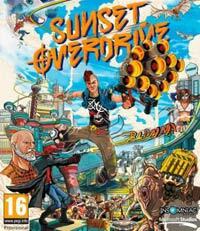 Sunset Ovedrive is a third person shooter created by Insomniac Games studio, known for popular arcade games from Ratchet & Clank and Spyro series and exclusive for Sony consoles FPS series Resistance. The title presents a rather unusual and humorous approach to postapocalyptic themes. Sunset Ovedrive takes us to the title city of Sunset. It is the year 2077, the market giant Frizzco Corporation is preparing to present the new energy drink OverCharge Delirium XT. The inaugural event that launches the product on the market quickly turns into chaos. It turns out that all those who taste the golden beverage change into mindless mutants. The player takes on the role of an accidental cleaner (or cleaner) - one of the few people who have not drank a drink from Frizzco - and stands up to fight hordes of mutants. There are more survivors in the city itself, divided into various factions, among which we can find Troop Bushido modeled on samurai or LARP aficionados Fargarths. Sunset Overdrive is a sandbox third person shooter. Creators focus on freedom of movement, taking inspiration from series such as Prince of Persia and Tony Hawk's Pro Skater. We can climb up to any obstacles, run like a Spider-Man on the walls, and even slide ("grind") on high-voltage lines - what counts here is above all humour, dynamics and efficiency of movement. This element of fun translates into style, another important mechanics of the game. The more spectacular "tricks" we perform and the more ingeniously we finish enemies, the faster we fill up the appropriate indicator, which results in unlocking special power-ups (Amps), which give the hero various powers. We find here, among other things, levitation and the possibility of causing a tornado or even a nuclear explosion. There are more than 50 such improvements in total. And what do we fight against mutants? The developer has put at our disposal a substantial arsenal, filled with more or less miraculous means of extermination. Among them we can find among others: TNTeddy, a teddy bear launcher filled with dynamite, Roman Candle - a revolver throwing fireworks or The Dude, whose ammunition consists of jumping bowling balls. Weapons are acquired as the game progresses or we buy for virtual currency. The basic type of opponents are mutants, abbreviated to OD (OverCharge Drinkers). Apart from cannon meat, there is no shortage of more specialized enemies, such as Herker or Bowler with his smaller brothers, who has an acid thrower in his shoulder (which is nothing else but an OverCharge drink). Human opponents called Scabs also stand in our way. The production is characterized by a colourful, pleasing to the eye graphic design with a bit of comic character (cel-shading technology was used here). An important role is played here by multiplayer mode, focused primarily on cooperation.